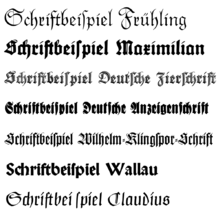 Blackletter or Gothic script is an old way to write. Blackletter in writing or print was used in Western Europe from about 1150 to the 17th century. It was used for printing in Germany until the 20th century. Letter shapes in printing were copied from letter shapes in a style of handwriting. So, the Gothic script of northern Europe and the Latin script used in Italy were both copied into print typography. Some people call blackletter Old English. This is not right, because Old English is a language, not a script, and many centuries older. Also Gothic script has nothing to do with the Goths. They lived in central Europe from the 3rd to 6th century and wrote in runes. Blackletter must not be confused either with the ancient Gothic alphabet or with the sans-serif typefaces that are also sometimes called Gothic. The term Gothic was first used to describe this script in fifteenth century Italy, in the midst of the Renaissance. Scholars thought it was a barbaric script: Gothic was a synonym for barbaric. Not only were blackletter forms called Gothic script, but any other seemingly barbarian script was also labeled "Gothic". In contrast, the humanists preferred the Carolingian minuscule, a highly legible script. They called it littera antiqua, "the ancient letter", believing that it was the script used by the Romans. But actually it was invented in the reign of Charlemagne. Carolingian minuscule was the direct and linear ancestor of blackletter. Blackletter came from Carolingian when Europe in the twelfth century needed new books in many different subjects when more and more people learned to read. New universities were founded, each writing books for business, law, grammar, history, and other topics, not only religious books, where earlier scripts were used. These books needed to be produced quickly to keep up with demand. Carolingian, though legible, was time-consuming and labour-intensive to produce. It was large and wide and took up a lot of space on a manuscript in a time when writing materials were very costly. As early as the eleventh century, different forms of Carolingian were already being used, and by the mid-twelfth century, a clearly distinguishable form, able to be written more quickly to meet the demand for new books, was being used in north-eastern France and the Low Countries. This page was last changed on 28 November 2016, at 10:26.